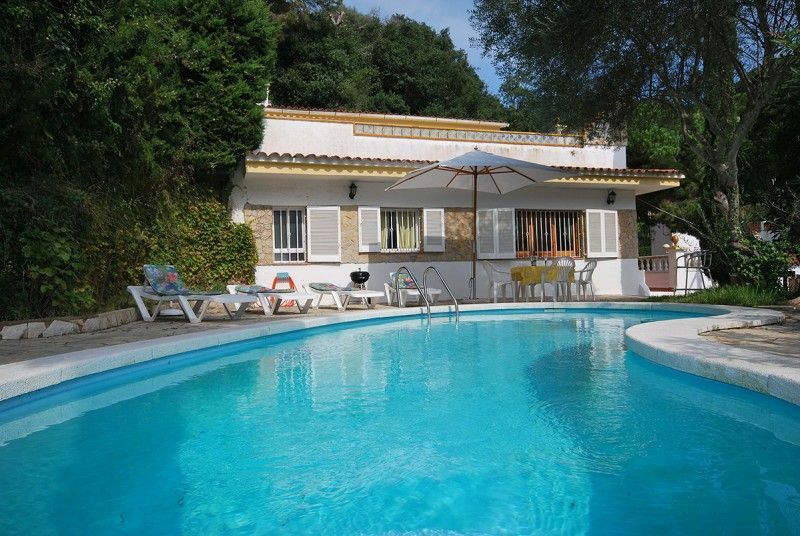 Club Villamar - The perfect villa for a sun filled family holiday on the Costa Brava! Sheltered detached holiday villa with a beautiful view and on walking distance of the beach! Internet access available. You can start enjoying yourself in this glorious holiday villa Amalia. This villa will guarantee you luxury, peace and quiet, and relaxation. You will experience these things from the moment you drive up to villa Amalia through a quiet cul-de-sac. You can park your car easily and safely on your own private property and you enter the villa on the first floor. When entering the villa through the living room you will find two nice bedrooms a bathroom on the same floor. The folding doors will bring you to a spacious balcony where you can relax and enjoy the view. The kitchen is furnished in a modern style and is fitted with all modern conveniences. The entire residence radiates a certain snugness. The light interior in combination with the Spanish functionality makes Amalia a real top class villa. Outside the villa it is even more beautiful. Via a glorious terrace on the side of the holiday villa, you get to your own swimming pool, that will quickly persuade you to have a nice dive. The practical garden furnishment make it easy for you to dream away beside your own private swimming pool. You can really enjoy the Spanish holiday sun here. This residence is, because of the amount of privacy it offers, very suitable for families. The owner of the villa lives on the top floor of the villa, but you will be able to use all the facilities in and around the villa in privacy. Your holiday villa is located in the small and snug neighborhood of Canyelles and is separated only 200 meters from the beach. The sand and sea are like paradise in this beautiful bay and is carved out between the high rocks. You can really enjoy the sun, sea, and the beach here. You’re at the right place too if you want action on and around the water. A delicious restaurant with nice view of the sea make the party in this 'Blue Lagoon' complete. Outside Canyelles it is only a few kilometers to the right to Tossa de Mar with its well known castle. Tossa is a real authentic fishing-village where you can enjoy yourself day and night. A nice bay with a glorious beach and stretch of sea that is surrounded with many shops and delicious restaurants, where the fish is caught in the sea and directly served on to your plate. If you want a little more excitement you can follow the road from Canyelles to the left. It is only a few kilometers to the well known seaside resort Lloret de Mar. There you will find the real holiday life at any time of the day. Café's, restaurants, nice shops, beautiful sandy beaches and glorious views from the rocks. But you can also find peace and quiet here on the golf course or a little horse riding at a riding school. And do you feel like testing your luck? Then you can visit the biggest and newest casino of Europe in Lloret. All in all Lloret is a must when you visit the Costa Brava. And every day you end up in your own villa Amalia, where the peace and quiet is waiting for you again. You can make all this your own for a wonderful period of time by booking this villa easily and quickly online at Club Villamar. If you want a little more excitement you can follow the road from Canyelles to the left. It is only a few kilometers to the well known seaside resort Lloret de Mar. There you will find the real holiday life at any time of the day. Caf�����'s, restaurants, nice shops, beautiful sandy beaches and glorious views from the rocks. But you can also find peace and quiet here on the golf course or a little horse riding at a riding school. And do you feel like testing your luck? Then you can visit the biggest and newest casino of Europe in Lloret. All in all Lloret is a must when you visit the Costa Brava. And every day you end up in your own villa Amalia, where the peace and quiet is waiting for you again. You can make all this your own for a wonderful period of time by booking this villa easily and quickly online at Club Villamar.